Hyundai, with over a million vehicles sold in Australia since 1986, is among the big timers of the vehicle industry these days. The company is steadily filling niches in the marketplace as it expands its model range. The South Korean brand sold more vehicles in Australia last month than Ford thus proving its marketing strength. In fact, Hyundai came in as the #4 best selling brand in September 2012, behind Toyota, Mazda and Holden. September's 7,815 sales gave Hyundai an 8.3% market share. The Accent is just one of many popular Hyundai models. 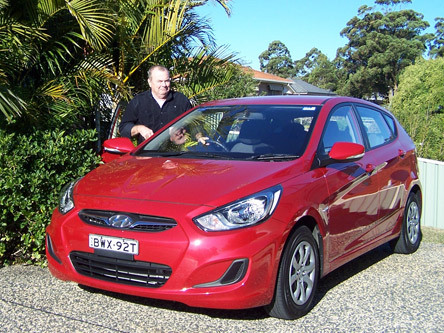 Our test car, on this occasion, was the Hyundai Accent Active 5-door hatchback fitted with a 1.6-litre diesel engine and a 6-speed manual transmission. Pricing for this model begins at $19,490*. The Accent originally came along in the 1990’s to supplement the smaller Excel and it was available as a 3-door hatch or a 4-door sedan. Hyundai have completed a make-over of the Accent range and it is now available with petrol and diesel engine, and either hatch or sedan. The diesel engine is matched to a six-speed manual or a four-speed auto transmission. 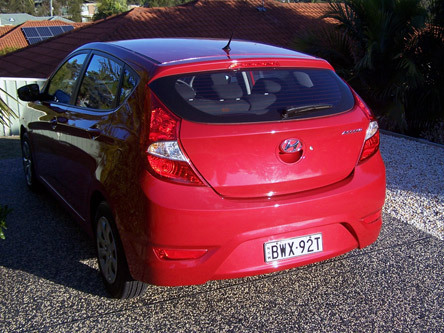 Interestingly, the Hyundai Accent now claims the mantle as Australia’s cheapest diesel-engined car. Around the city and suburban environment the little manual diesel works well and, for the most part, you won’t need a gear higher than fourth. The Hyundai Accent Active is the cheapest diesel passenger car in the nation! The manual Accent is fitted with an electronic indicator to advise the driver of the most optimum time to change up or down a gear. The indicator is in the centre of the instrument cluster. This assists with fuel consumption and is becoming common place in vehicles. On the freeway the Accent impressed as we motored north in top gear with the occasional down shift to fifth. The clutch is light and positive with close throws of the gear lever. All variants have interiors trimmed in black. The Active gets black cloth seats and offers acceptable comfort including the driving position. Passenger comfort in the rear is surprisingly good with adequate leg room. The back seats can fold 60/40 to increase the volume of the cargo area. With the rear seats upright, the cargo area has a capacity of 370 litres which is quite reasonable for a vehicle this size. Connectivity is excellent considering the price of this vehicle. Bluetooth connectivity is a standard feature and allows for hands free phone use and audio streaming. The steering wheel includes controls for audio and telephone. There are also USB and auxiliary connections available for music. 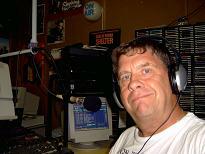 Users of iPod/iPad will need to purchase the necessary cable to connect these devices and retain full functionality. Power windows are standard for the front and rear. At 4,115 mm long the hatch will take up slightly less room in your garage than the sedan which is 4,370 mm long. To some people that extra 255 mm of space may mean a lot! Both body styles are the same width at 1.7 metres. The 1.6 litre diesel engine is new to the Accent range. Released in January 2012, the diesel features common rail direct injection (CRDi) with variable geometry turbo (VGT). This very capable engine produces 94 kW at 4,000 rpm and 260 Nm of torque in the range 1,900 -2,750 rpm. The Accent range is supported by MacPherson Struts with coil springs at the front and a coupled torsion beam supports the rear. Power steering and 4-wheel disc brakes are standard. Steel rim wheels with plastic wheel covers are fitted to the Accent Active, whilst other trim levels offer alloy wheels. The spare wheel is a full size steel rim. 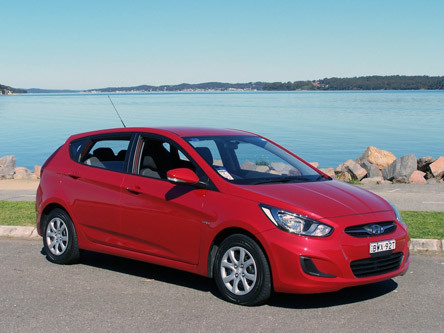 A five star ANCAP safety rating has been achieved by Hyundai for the Accent model range. Six SRS airbags are fitted. These being conventional front airbags for the driver and front seat passenger as well as thorax and side curtain airbags. Three-point retracting seatbelts are fitted for all seating positions. Speed sensing automatic door locking is now installed on all Hyundai vehicles. There are three anchor points in the rear for baby safety capsules or child restraint products. To assist Hyundai to gain the 5 star ANCAP rating all the Accent model range are equipped with ABS, BAS, EBD, ESC, TCS and Vehicle Stability Management (VSM) which detects if the vehicle is in danger of turning over. Electronic systems take over to stabilise the vehicle if it is deemed that the car is out of control. 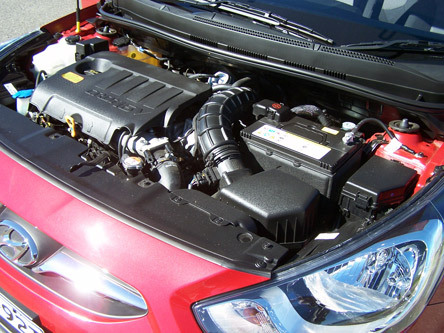 The diesel excels when it comes to fuel economy. Hyundai claims the fuel consumption of just 4.5 litres/100 kilometres on a combined cycle. The fuel tank capacity is 43 litres and despite the relatively small tank, the frugal motorist has a reasonable chance of driving Sydney to Melbourne on one tank of diesel. Bring it on I say! CO2 emissions are 121 grammes per km. No options are available on the Accent. However, there is the usual plethora of dealer fitted accessories available across the range. Front and rear park sensors are available and 16-inch alloys can be purchased for the Active. A tow bar is not available. Standard equipment for the Active hatchback includes a air conditioning, trip computer, tilt adjustable steering column, height adjustable driver's seat, auto down for the driver's power window, digital clock, rear window wiper, an MP3/CD player with AM/FM tuner and more. Three trim levels are offered. The base model is known as the Active, followed by the Elite and then the range topping Premium. The Accent Active is priced from $16,990* for the petrol powered five-speed manual. The four-speed automatic gearbox adds $2,000* to the price of all trim levels. The diesel power plant is only available in the Active trim level and pushes the price up by $2,500* to $19,490* for the manual and $21,490* for the auto. Moving up the range, the Elite is a better looking car, receiving classy 16-inch alloys and fog lamps. The look attracts a $1,500 premium over the Active. The Elite is priced from $18,490* and is only available with the petrol engine. The Premium is only available as a hatch with the petrol engine and is priced from $20,990* for the manual transmission. Inclusions are mainly conveniences including rear parking sensors, rear view camera, climate control, leatherette seats and an electrochromatic rear view mirror. With the automatic gearbox, the Premium also gets a proximity key and push button start. All Accents sold to private buyers receive the Hyundai iCare protection which includes a 5 year, unlimited kilometre warranty. Service intervals are 15,000 km or 1 year and capped price servicing is included for the first three years or 45,000 km. Complimentary roadside assistance is included for the first year of ownership and can be extended for up to 7 years. The Hyundai Accent is a capable package and we are particularly impressed with the performance, pricing and economy offered by the Active diesel. And we reiterate that the Hyundai Accent Active is the nation's lowest priced diesel-engined passenger car.